Welcome to the Day 4 of Applied Digital Skills Week! We’re continuing to explore Applied Digital Skills curriculum with a twist. Taking what your students need, your classroom goals, and the curriculum you’ve explored… ask yourself this: How will you customize and use Applied Digital Skills in your classroom? On day 2 of Applied Digital Skills Week, you explored various lessons that make up the Applied Digital Skills curriculum. Today, you’ll choose a lesson or activity and share how you will customize it to meet the learning goals (formal or informal) in your classroom. To enter today’s challenge and for a chance to win a $25 Amazon card, share the hyperlink to a lesson, activity, or extension and tell us how you might customize it for your students. Include what and who you teach! Share on Twitter, Facebook or Instagram with the hashtags #GrowWithGoogle and #EdTechTeam. Remix, Adapt, Personalize: It’s what we do! One of the things we learn as teachers is that one size does not fit all when it comes to our learners. It’s important to remind ourselves of this as we explore the different lessons and activities offered as part of Applied Digital Skills. Luckily, there are unlimited opportunities in the curriculum to customize the learning experience for our students or adapt the lessons for the subject they are learning. Amanda Alford is a 7th grade technology and science teacher in Indiana. Amanda thought outside of the box and remixed the If-Then Adventure Stories lesson for her science students! At the beginning of each term, she asks her students to create If-Then-Adventure stories about students who didn’t follow lab safety rules. Amanda believes that teachers can use “If-Then Adventures” for nearly any science topic. So even if your students have already learned lab and equipment rules, there are countless other ways to remix this curriculum for the science classroom. See how Amanda and other teachers are remixing the Applied Digital Skills curriculum to meet the needs of their subject matter. Sign up for quick and easy email courses to receive 5 subject-specific tips in your inbox. Customizing Applied Digital Skills Lessons for English Language Learners. Digital skills are an important part of education at any level, and can equip students with critical life and job skills for the 21st century. They can also help your English Language Learners acquire new skills to support them in their learning journey. How does Google’s Applied Digital Skills curriculum support this? The curriculum encourages creativity and allows for easy connections to familiar cultures. The lessons are video-based featuring transcripts, captions and the ability to speed up or slow down the video. Natalia LeMoyne of Guilderland, New York, offers her experience with the curriculum in her ELL class along with some tips and tricks to make it impactful and effective for ALL students across this 5-day email course. Using Google Search to get extra help. What if your students are working on a different project for class, but they need help creating a Table of Contents in a Google Doc? 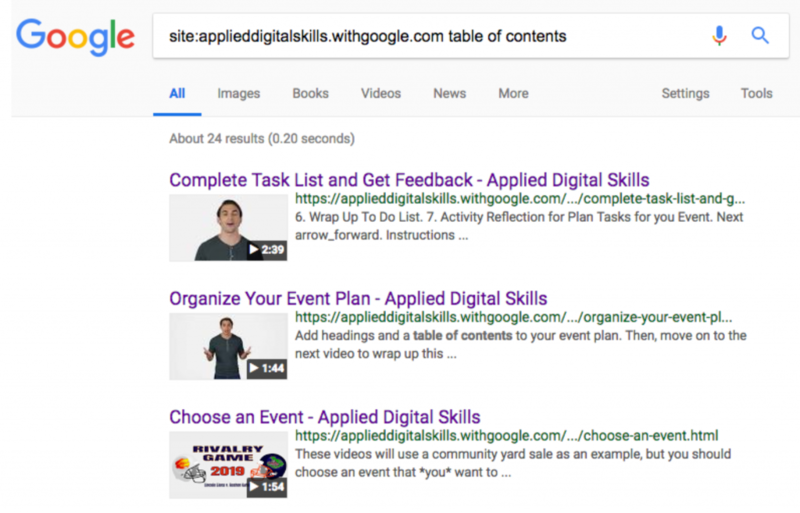 Here’s a bonus Google Search tip for finding exactly what you need in Applied Digital Skills. Type site:applieddigitalskills.withgoogle.com table of contents in Google Search. You’ll get results from the Applied Digital Skills website about the table of contents. You can quickly find one short video that can help your students with this task! Applied Digital Skills Week is not over yet. Join us tomorrow for day 5 and one more challenge! 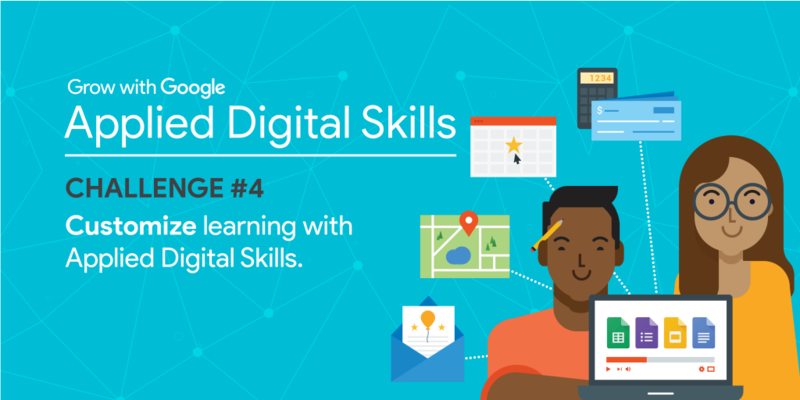 If you haven’t signed up to get started with Google’s Applied Digital Skills, give it a try today and customize learning for your students. *NO PURCHASE NECESSARY. 50 US/DC, 18+. Ends 10/12/18. For rules, prizes, odds, important dates, & all details, visit rules. Void where prohibited. Sponsor: Educational Technology Inc. dba EdTechTeam. Restrictions apply. Take Applied Digital Skills for a Spin! It’s Your Chance to Be a Student	Applied Digital Skills Week – It’s a wrap, folks!